Been working on this gobot-esque tank for the past couple of weeks. He's an original design, based on a combiner concept by the one and only Thew. Totally transformable, and has separate foot kibble for his limb mode (still under construction). I've taken a lot of inspiration from the older combiners: the individual robot modes and the gestalt will practically be bricks. I'm trying to get as much mass and presence out of the vehicle modes/limb modes to (over)compensate. This particular robot has so far used up about three sheets of 160gsm cardstock, lots of dollops of glue, and a single toothpick for the neck flip-me-do. (total cost: a dollar fifty?) I've gotten a lot of 'why don't you just use sheet styrene' comments from my crafter friends before, and the simple answer is that paper's my absolute favorite medium. It can get ridonk sturdy once you actually assemble it into something, and you're never at a shortage of it. Starting this thread as an informal log for my progress. Last edited by soak314 on Wed Dec 04, 2013 6:54 am, edited 1 time in total. wow! if ya textured that tank up with structure paint, black primer and some dry brush it would be INSANE. "Bruticus hates Cybertron! Bruticus hates you all!" It's basically making a bunch of paper polygons and gluing them together. Some people design using 3D modelling software, print out the exploded schematics, and work off that. I prefer scratchbuilding with a pencil and ruler. Bruticus wrote: wow! if ya textured that tank up with structure paint, black primer and some dry brush it would be INSANE. I'll just be layering up with more paper shapes, and probably won't rely too heavily on a drybrush (though I will be doing so on the treads, edges, and visible metal bits). I've tried the structuring paint on buildings before, works great if you want a part to look rusted or stony. And primer, while a prerequisite for most materials, actually isn't that necessary for paper. Paper tends to absorb the paint, effectively making the finish even and highly scratch resistant. I'd love to see more. This is amazing stuff you have here Soak. Have you considered using styrene instead, and molding parts? jiptravolta wrote: This is amazing stuff you have here Soak. Have you considered using styrene instead, and molding parts? Yes and no. I love how you can make lots of convincing nicks and scratches on styrene, but I reserve plasticard for my orky kitbashes. The stuff's also way more expensive than cardstock, so I chose to stick with what I work with best for this project. I am considering styrene for the combiner leader's joint assemblies, as I plan to do a tiny bit of kitbashing with some scavenged hinges for that guy. Overall, the combiner's going to end up at least 90% paper. Molding is a definite yes. What you're seeing now is the base for the tank, I'll probably be using greenstuff to add on the less geometric details such as pipes (used ever so sparingly because I have no cashmonies). I've heard plumbers putty works great too, but I honestly can't afford to buy some to try it out. Thanks! 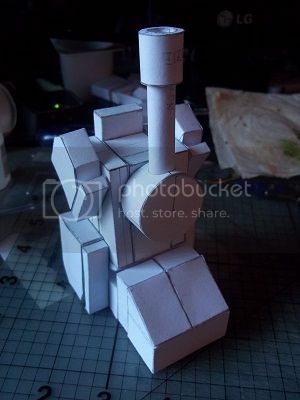 Lots of TF papercrafts out there, but so few of them can actually manage to transform. Foot kibble was a necessary sin, methinks. It makes for more awkward stowing away/disassembly, but contributes so much to the bulk of the gestalt. Converting the thread into an general dump of all the stuff I do creatively. Now with added variety, thanks to income! 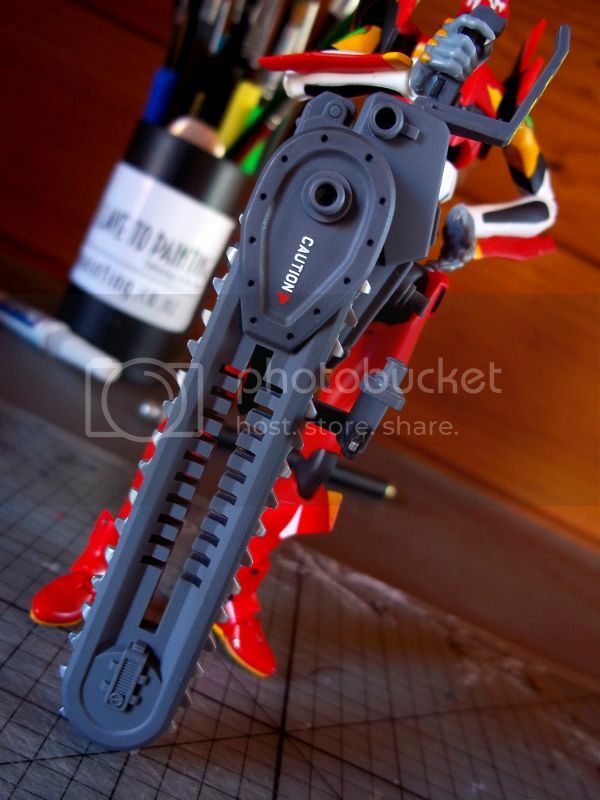 Kotobukiya Dynamic Chainsaw. Bare plastic + tamiya flatcoat. 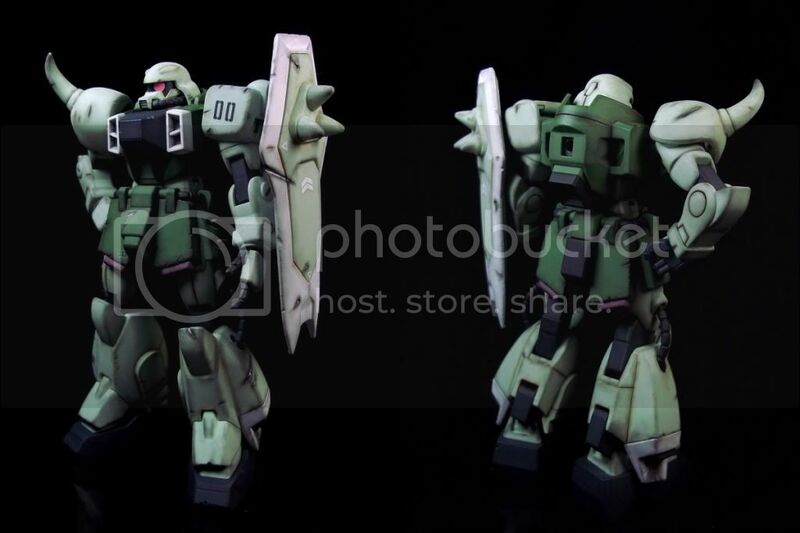 Best Mecha Collection Zaku I. This is the G1 of gundam plastic model kits. Tamiya Acrylic spraycans, Citadel acrylic paints, pastels, and flatcoat. 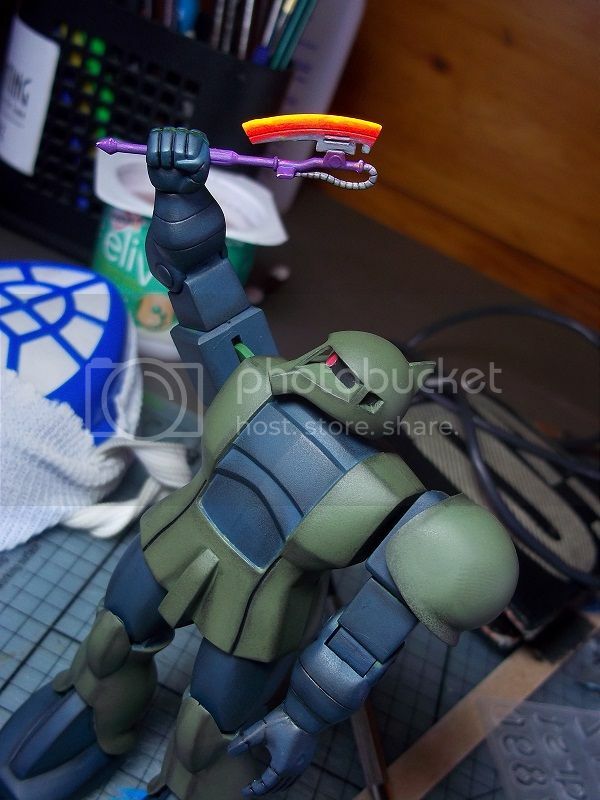 Zaku Warrior WIP custom: Zaku Weaponmaster. Currently missing her weapons. Citadel acrylics, pastels, and tamiya flatcoat.